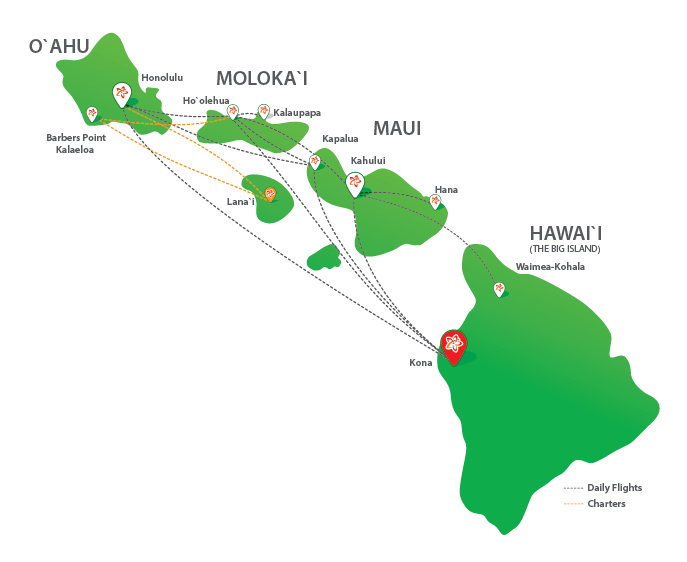 Mokulele Airlines takes you to the city of Kona on Hawai`i’s Big Island, we fly directly into the commuter airport at the Ellison Onizuka Kona International Airport at Keāhole, since we operate out of the commuter airport there is no TSA, a convenience unlike traditional airline travel. If you crave sports and adventure then Kona is the place for you. Kona is home to the famed Ironman Competition each fall and offers terrains from desert, beach, ocean, rainforest, volcanos, etc. Because of the unique temperature zones each trip to the Big Island is unique and varied depending on which part of the island you go see. We recommend renting a car as it the best way to see all this beautiful island has to offer. 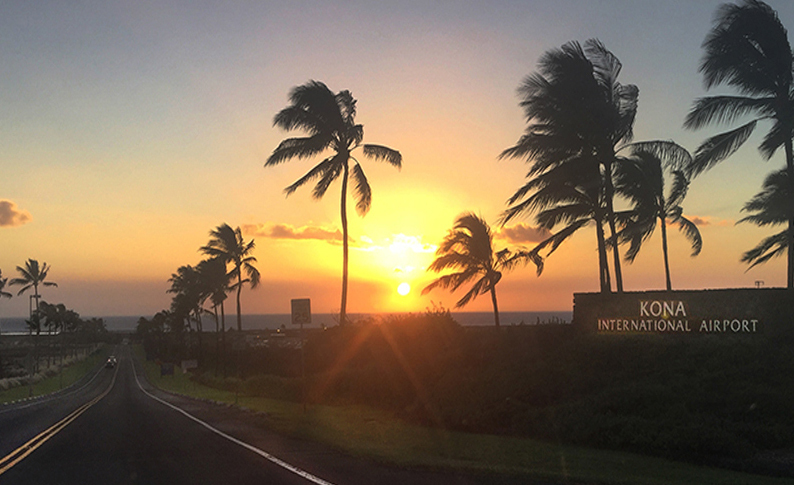 A Kona vacation is the perfect place for a trip to create memories and experiences. Some of our favorite things to do on the Big Island include snorkeling, deep-sea fishing, surfing, biking, and hiking through lush rainforests. With Mokulele Airlines’s affordable airfare, you can even go to the Big Island for the day just to visit the Hawai`i Volcanoes National Park. If you are a golfer, you can play a round on one of over 20 world-class, jaw-dropping courses on the Kohala Coast. So come take a Kona vacation on Mokulele Airlines. If adventure is not what you have in mind, make Kona your romantic relaxing getaway. You can stay at one of the many cozy bed and breakfasts along the coast or at the Four Seasons Resort or if you head south we suggest staying at the Royal Kona Resort in the heart of Kailua-Kona. Come and see for yourself why so many artists find the island seductive and inspiring. Visit one of the many galleries, museums, or theaters and experience the Big Island’s beauty through its local art. Kona is the place to go for adventure. A Kona vacation is one full of snorkeling, deep-sea fishing, volcanoes, Scuba diving, underwater submarine tours, and hiking through lush rainforests. Even before you are welcomed to the Royal Kona Resort by the gracious staff you will be embraced by a swirl of salt air -- ha, in Hawaiian, the life-breath of the islands. You will see it ruffling the fronds of the palm trees that fringe the 12 manicured acres, tossing the waves against the stark black lava rocks at the property's feet, marching columns of clouds across the uninterrupted expanse of sky. The air here presents you with the perfume of tropical flowers. It is a reminder that you are on the Big Island of Hawai'i, a reminder to breathe, to exhale, and completely relax.This is the setting of the Royal Kona Resort. E Komo Mai. Welcome. Visit http://www.royalkona.com/ to book. 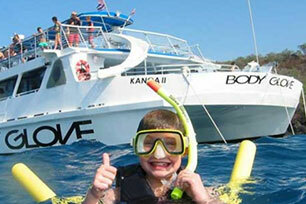 Fly to Kona on Mokulele Airlines and participate in a fun day of water activities with BodyGlove. Participate in Snorkel & Dolphin Adventure, Whale Watching Excursion, Historical Dinner Cruise, or Lunch Cruise (Wednesdays only). -All Inclusive Tours (Air & Tours) Starting At $245 per person. -Tours Only Starting At $95 per Adult and $76 for a Youth 6-17, Children 5 and under are free. Do you allow overnight parking? Yes overnight parking is allowed- see pay station for details. If yes, where can the customer park? A: You will need to park in the long term parking by the main terminal of Ellison Onizuka Kona International Airport. Please park in the appropriate lot based on your length of stay and then walk back to the waiting area for your flight..
How long are they able to leave their vehicle? Do they need a pass, if yes, how do they get the pass? Please follow directions for parking as displayed on airport signage. What are the fee’s associated with parking? Is it cash only or credit card or both? Who do they pay? There are fees associated for parking in our lot that is managed by the State of Hawaii. Is there a shuttle back from the parking lot? No, there is no shuttle from the parking area back to the terminal. How much time does a customer need in advance of their flight? Any other details specific to your airport in regards to parking. Airport Parking is available in the commuter terminal lot for a fee. Is there rental car service available at your airport? Yes. There is access to all of the major rental car companies. There is a shuttle that does come and pick up and drop off for the rental car services and the numbers are posted and available for you to call the companies for pickup services. If yes, which companies may they contact? Avis/Budget, Dollar/Thrifty, Enterprise, National, and Alamo. Please call rental company upon arrival to arrange pickup from Commuter Terminal. Is there a taxi/bus service? We do have a taxi service that is stationed by our gate that is available and a bus service that comes twice a day.